I have been stitching a little bit. I have the grass almost finished on the top portion of my neighborhood. I can't believe I'm getting close to finishing. I have really enjoyed stitching it. Your neighborhood looks gorgeous. You've really done a great job with it! I said it before and I'll say it again you are a very fast but accurate stitcher! Beautiful job so far. Love your neighborhood...Can I come live next to you?? LOL! Looks wonderful, Nicole. You'll have it done in a heartbeat. Can't wait to see the finish. wow Nicole, your neighborhood is coming along beautifully! I'm just excited to see your completion soon! You are such a fast and delicate stitcher. You must be so pleased now you're nearing the finish of this one? It looks fantastic Nicole, I really love this one. Goodness, you are getting close to a finish on this one. What's next? Beautiful!!! I can't believe you are almost finished and I still have yet to start!! I hope mine looks nearly as wonderful!! Great progress on LHN! You are going to be done in no time at all. 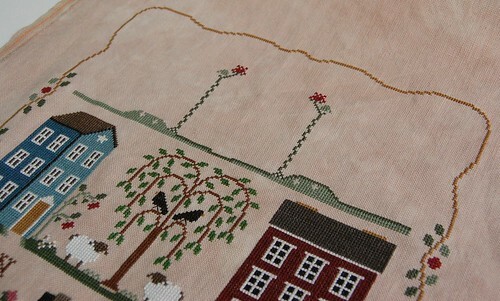 I am going back to stitch on mine now that the round robin is finished. Yours looks fantastic! It looks fantastic! On average how many hours a day do you stitch? And what do you do with all your completed projects? Hi Nicole: Had a blast scrolling thru your blog this a.m. Guess I'm very very far behind in my blog reading : ) What great projects you have going, knitting, canvas, needlework -- you rock! Your neighborhood looks lovely, and I love the Quaker piece also.